Three years ago, a television producer whom Rob Kennedy had never met walked into the office where Kennedy oversees a youth basketball organization and pitched a crazy idea: a nationwide, five-on-five basketball tournament open to almost anyone, with social media elements and a multimillion-dollar, winner-take-all prize. The organizers needed someone to connect them with players, aging and still in shape, who would make for rosters intriguing enough to sell the idea to national TV networks. Kennedy could make those introductions, and they tried to win him over with a video clip that showed the types of players who could reconnect with basketball during such a tournament — Division III stars who had long since conquered the business world, an ESPN fantasy league champion who might build a team, and Lenny Cooke, perhaps the most famous straight-out-of–high school bust of the last two decades. Three years later, the tournament is set to go in an altered form. The lead organizers, Vin Martelli and Jonathan Mugar, will later today unveil The Basketball Tournament, a 32-team five-on-five bracket with a $500,000 winner-take-all prize. The event will not be televised, though TBT may decide to live-stream the championship game, Mugar says. The lead investors have had ongoing talks with several national networks, and if the first tournament is a success, they will kick around the possibility of a future television deal or Internet-only broadcasting. But for now, they just want to see their vision play out from March through June. “This has been years in the making for us,” Mugar says. Any legal U.S. resident over 18 can participate, though eligibility and contractual barriers would obviously bar active NCAA and NBA players from playing in a tournament for money. But part of the fun is seeing what kind of teams thoughtful folks put together. Royce White has expressed interest in forming a team, Mugar and Martelli say, though White hasn’t made a firm commitment yet. However, his impending 10-day contract with the Kings will put an end to that. Bob Hurley Sr., the legendary coach of St. Anthony’s High School in New Jersey, has already agreed to oversee a team of alumni players, he says. Terry Dehere, a St. Anthony’s grad and former Big East Player of the Year at Seton Hall, is organizing the group. If they win, the team will donate the prize money to the high school, Hurley says. Players on Cornell University’s 2010 Sweet 16 team have already started trading messages about reuniting for this tournament, Mugar says. 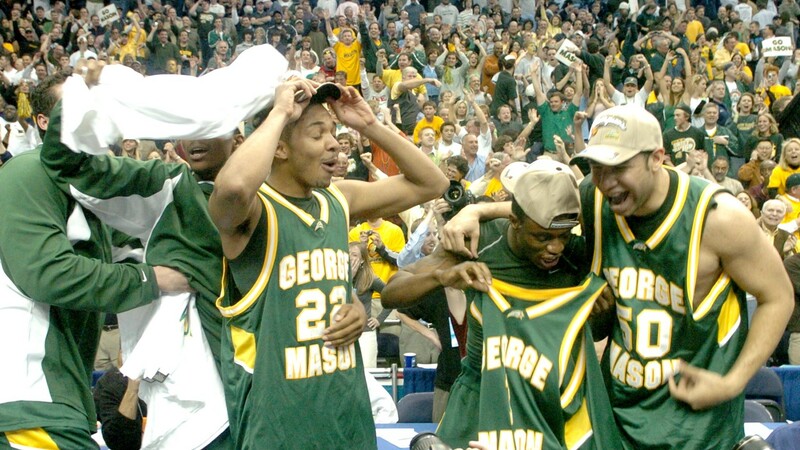 Ditto for the George Mason team that made the 2006 Final Four, and for a group of recent Louisville alumni. The organizers would love for a strong women’s team to enter the competition. Kenny Hasbrouck and Josh Selby, well-known college players who didn’t make a dent in the NBA, have also shown interest, Mugar and Martelli say. Picking the teams is the fun part. Any group of between seven and 10 players can apply for one of the 32 spots on TBT’s website (launching today). Every team has to have a “general manager” who selects the players, manages the team, and recruits “fans” through the website. Every “fan” must fill out a simple form to become official, and any team wishing to make the 32-team field must recruit at least 100 such fans — and likely thousands more. The 24 teams with the most fans will earn automatic bids into the 32-team field. The tournament organizers will choose the remaining eight teams, provided they’ve all met a baseline of 100 enlisted fans. That allows the tournament to make sure a high-profile team can make the field even if it somehow fails to pile up enough fans to crack the top 24. The organizers will then seed the teams based on talent and kick off a single-elimination tournament starting June 6 at Philadelphia University. The title game, with $500,000 on the line, will be June 28 at a location to be determined. The two participating teams will nominate several potential venues in their home-base cities, and fans will vote online to decide which team should host the game. Mugar and Martelli envision the host team packing a high school gym, Hoosiers-style, with personal meaning to them. The tournament will pay travel costs for the “visiting” finalists. There are other cool social media wrinkles. Say the George Mason team is able to find only four alumni who can fit the tournament into their schedules, leaving a minimum of three open roster spots. The four players call fill those with their buddies, but they can also scour the TBT website for a list of available “free agents” — unaffiliated players eligible for any team who wants them. Those players have to upload photos and list a bunch of personal info — height, weight, age, preferred basketball position, highest level of experience, and other things. Perhaps most interesting: They must indicate how much of the $500,000 they would like in the event their team wins.